Remember my post about Staying Organized with a clipboard checklist? So! In that post, I also mentioned another thing that is imperative to helping me stay on task. And that’s my cheap and easy day planner. The one where you don’t have to print a thing. The one that you don’t even have to order. Unless you need standard office supplies of course. And the one that you may be able to build with stuff in your home already! I’m ecstatic to say, this is the only only ONLY day planner system that has stood the test of time for me. But don’t even blink, because before you know it, you’ll have built it. It’s that easy. 1. 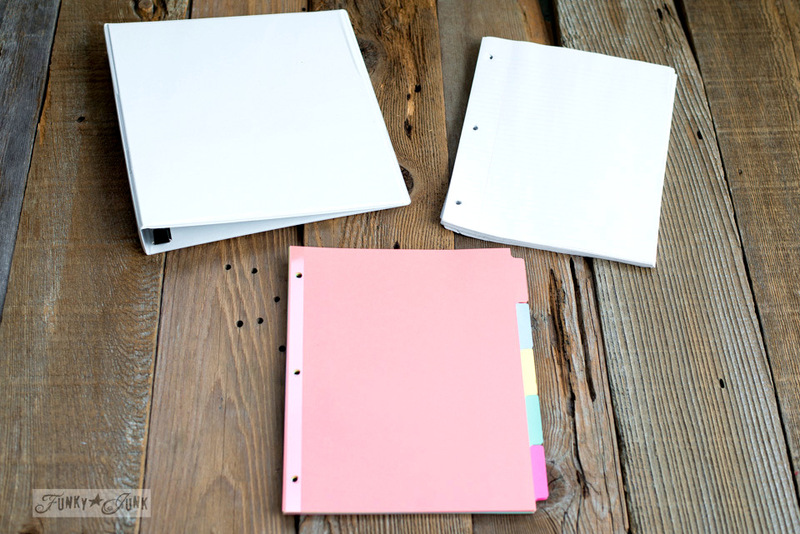 Fill the binder with the tabs and lined paper in between. 2. Label the tabs with things that matter to you daily, weekly, or even yearly. ie: Mine are Shopping, Post Ideas, Stencils, Travel… etc. 3. 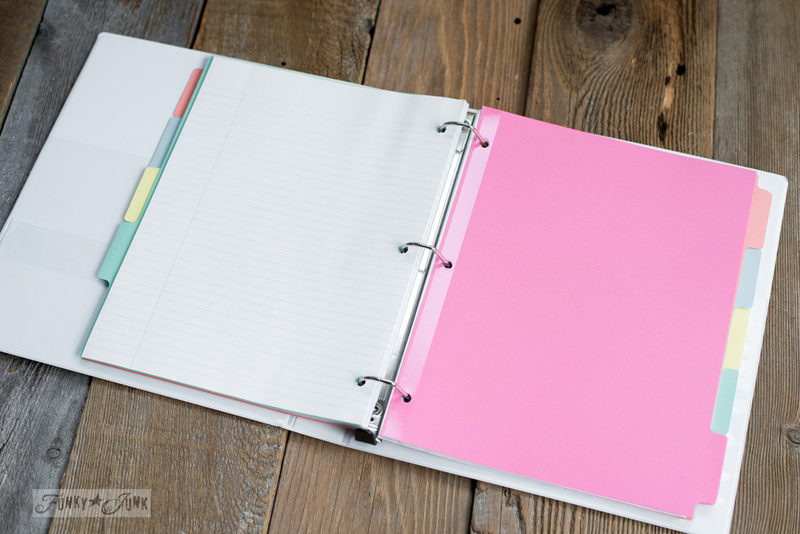 Start your book with NO tab, going straight to paper. Open to the first sheet. 4. On the left side, call this your MASTER LIST, then jot down your weekly or longer term goals for reference. 5. On the right side, enter the days of the week with S M T W T F S. Then slip the dates beside the days. 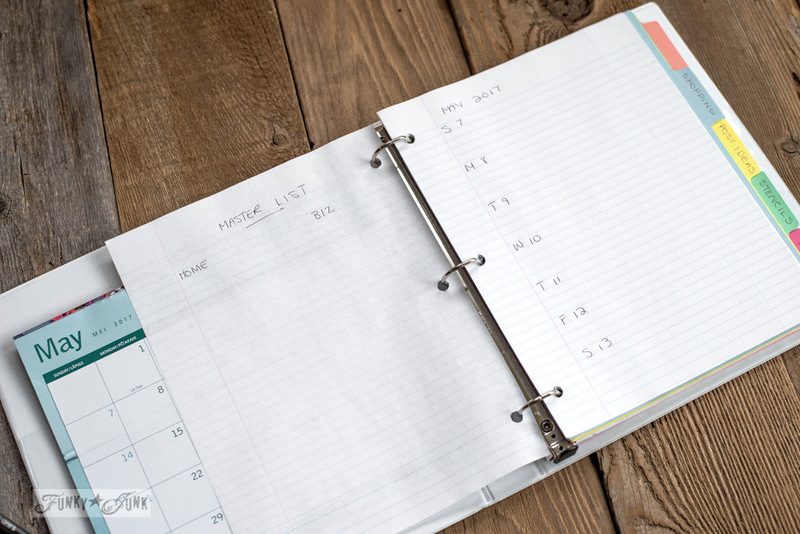 If you find you need more space for daily stuff, flip to the next page, and use the left AND right pages for the entire week. I find one page generally does it for me. 6. Transfer the master list stuff to the daily page. Cross off master list stuff only when it’s actually done. Cross off daily stuff as it’s done. It’s very satisfying btw! 7. 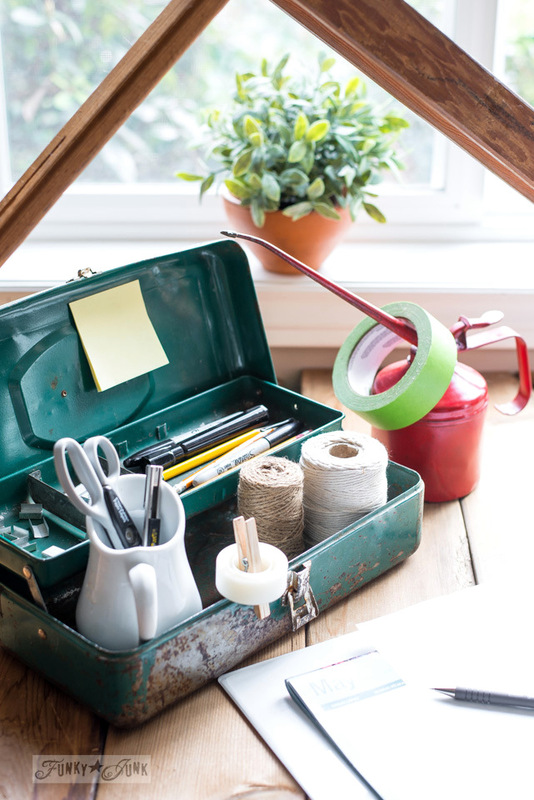 Slip an 8.5 x 11 paper calendar behind the master list for easy reference and jotting notes. Need shopping or supplies? Flip to the appropriate list under the desired tab, then take a phone picture of it. This way, if you don’t end up getting it all, your original reference is still there. This works so well for groceries! You could make fancy printable pages if desired. My original day planner was like that. In fact, I had plans a few years back on making it into a cheap ebook! But I didn’t like printing stuff all the time, so this was just easier, and easy always stands the test of time, doesn’t it? One day I may do it. Maybe. Never mind. I doubt it. My main scheduler is by the kitchen phone. Because space is an issue, this pipe shelf made from 2x4s was customized so the planner can slip underneath, giving me back my counter again. It’s perfect! You may also notice, I have a spiral ringed notebook on the left side, above. I have one by each phone, one beside the computer, and one in my truck. I simply date the top page, then when jotting quick notes via a phone call, the info is always available for reference later. Invaluable! And sure beats lost post it notes. Because the upstairs was already organized, I decided to make this 2nd scheduler for my downstairs computer. But I needed a new idea to help organize needed office supplies. 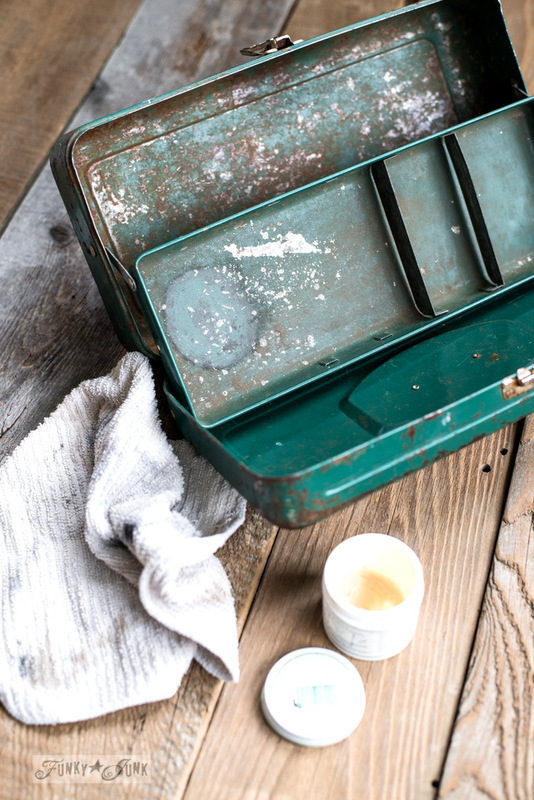 That’s where this little beat up metal tackle box came in handy! It was pretty dirty, so I wiped it down, then polished it with a little of Miss Mustard Seed’s Furniture wax. Hemp oil is fabulous for metal too, but I was out. HERE is a post on how I use oils and waxes to enhance finishes on wood and metal. Love how the tackle-box offers different levels, and keeps everything together. Portable, too! 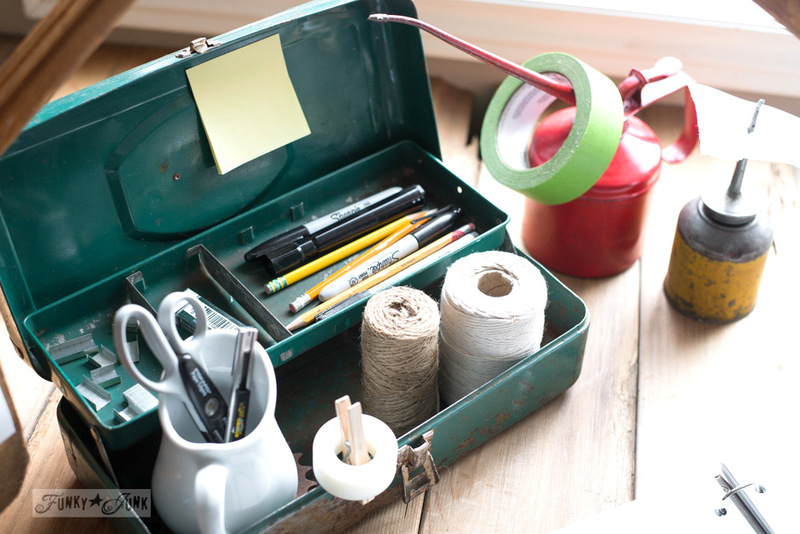 And if you have a couple of vintage oil cans, let them help you grab small notes / receipts, or hang masking tape. HERE is another toolbox organizer I used for my iPhone. And a branch handled wood toolbox for this kitchen phone station. My downstairs office is SO organized now! Guess I’d better actually read the planner next, huh? .Think you’ll try this idea?! 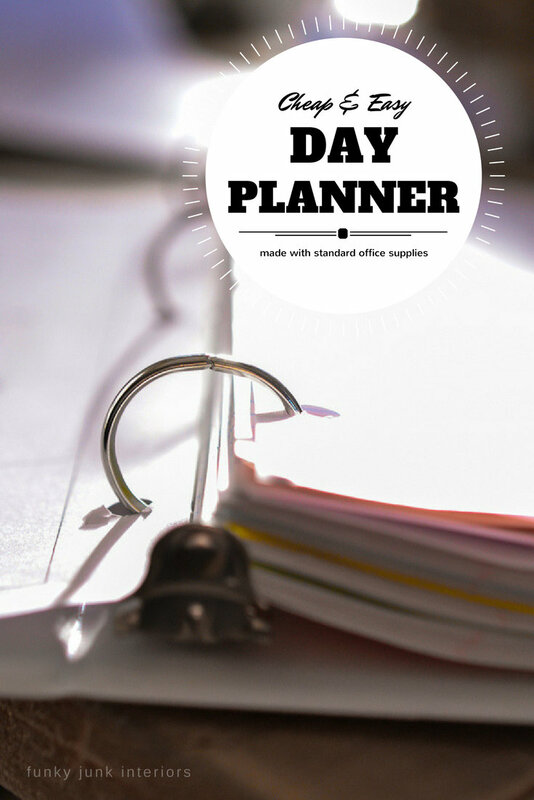 Do you have a fav planner that works best for you? Disclosure: This post contains Amazon affiliate links so you can easily find my fav gear. I am also compensated as a writer on eBay. You have simplified a planner so that even I can manage putting one together. I’ve always been able to remember things without having to write them down. But the older I get the less I can count on that trait. I’ve seen videos on You Tube about planners and many are too fancy smancy and overly decorated for my taste. Now thanks to your planner suggestion I feel I can put one to good use. Thanks so much for all your suggestions and tips I see and can use. I may not comment much but I’ve been enjoying your blog for many years. You’re to be commended for your willingness to share those brilliant ideas of yours. Love your easy, simple method. I have one similar but prefer the 5×7 size notebook…although I am an avid note taker, it still works, just add extra pages where needed. I must admit I do add some “fancy stickers or embellishments” at times, I am a paper crafter and mixed media type of gal. You enjoy working as a wood/junk artist,,,,,,I do it with paper, paste and paint. Thank you for the notebook tips. 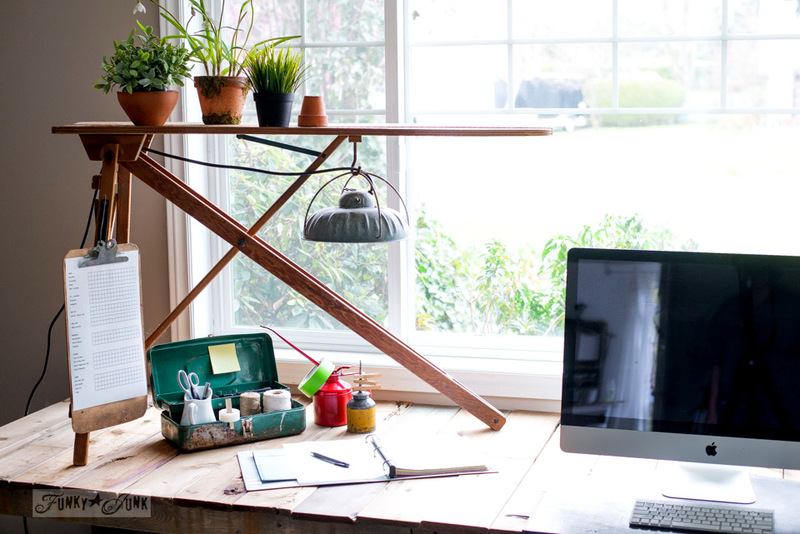 I was so loving the ironing board with the plants, tool box and shelf. 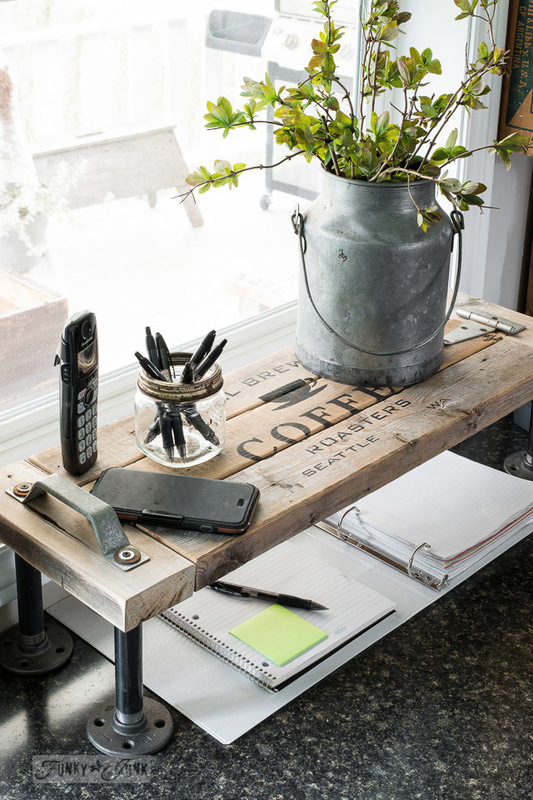 The rustic style and reuse of objects is awesome. Thanks for all the fun ideas. 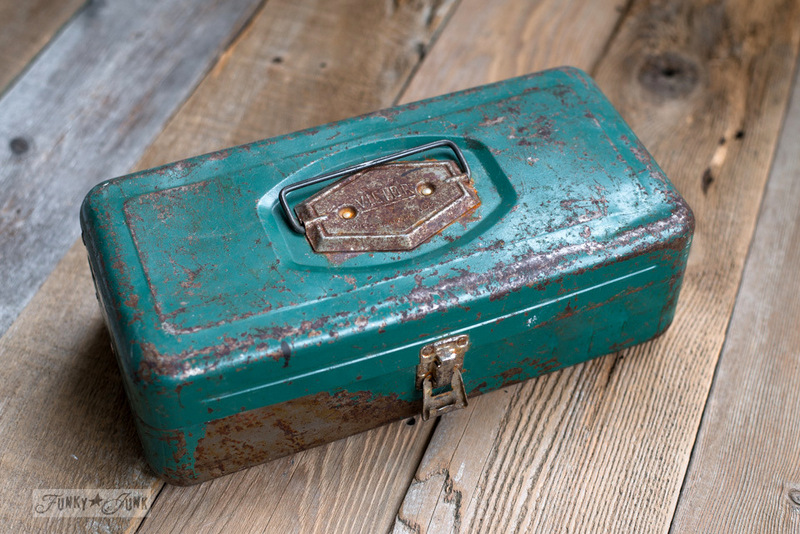 I actually have an old toolbox sitting in my garage right now, just waiting to be put to use! And I’m already making a list of all the things I’m going to put in it. And I love the simplicity of the planner. I’m just starting out on my blog and have tried so many different planning ideas but nothing seems to fit the bill so far. I’m going to put one together like yours tonight! Sometimes simple is better! 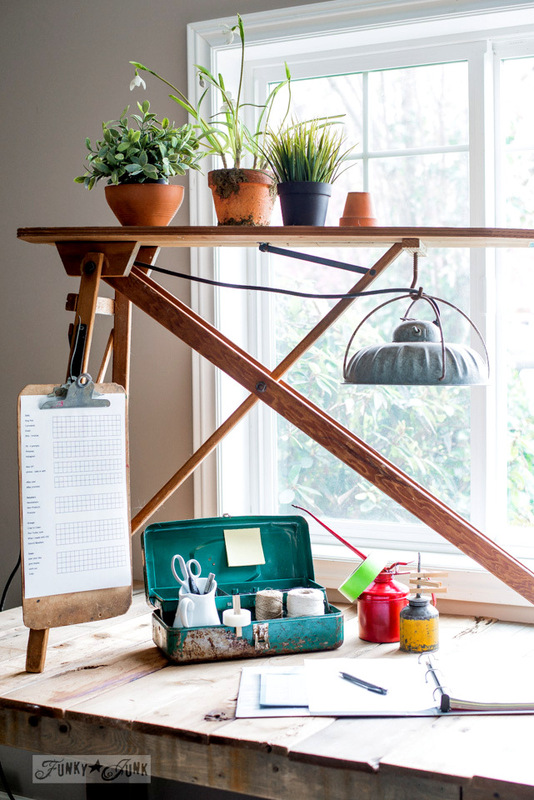 Also, what a cute idea with the old ironing board! Is it a full size one? I have a full size one that needs put to use as well but I don’t want to paint it or anything as it was my grandma’s. I used to use it as a plant stand as well but then moved and haven’t come up with a new use for it yet. Thank you for following along all this time! So appreciated and cool to hear where your own inspired self is going with all this! I’ve been keeping a planner similar to yours using a large notebook, dividing each page into my useful categories. Never thought of using a binder tho. I’ll give it a try. I divide my pages, by a center line for 3/4’s of the page, inside to do list and outside to do list. Bottom 1/4 of the page is divided into notes, to buy, msmts (measurements), etc. i cross out with simple line when done. When enough is crossed off, I rewrite/redraw a new page. I have another notebook for projects. I don’t start a project wo a inspiration pic, detailed steps, costs and specs. This is where the binder would be useful. I use binders a lot but never thought of using a binder to combine my notebooks. “Duh”. Thank you so much for binder/planner tip. Definitely going to use your tip. I have followed you for sometime, just recently signed up for your newsletters. I enjoy your use of old things. At one time in my life I had to shop thrift stores and yard sales to decorate and even get clothing for my young children. I too was a single parent – trying to make the ends meet. Through the years as the children have grown (which happens way to fast) my earnings are better and have less expenses…but I still shop thrift stores, yard sales and find I DONT WANT NEW. There is a place in my soul for things worn. Keep doing what you are doing. I think your posts and projects are fabulous and I will continue to follow. Thank you Drusilla, and I 100% am on board with the prefer-old-to-new bandwagon. Old things just tell such a wonderful story and their patina cannot be reproduced. I’ll do my best to bring more of the old antiques into play in the new year!